Ron Briley reviews books for the History News Network and is a history teacher and an assistant headmaster at Sandia Preparatory School, Albuquerque, New Mexico. He is the author of "The Politics of Baseball: Essays on the Pastime and Power at Home and Abroad." Sport is supposedly an avenue of escape in American culture where fans can seek refuge from the serious political concerns of the day. Ridicule is often reserved for athletes, invariably on the political left, who violate the neutrality of sport by introducing elements of protest and controversy into the games. For example, 1968 Mexico City Olympic medalists Tommie Smith and John Carlos raised their fists in a black power salute and were expelled from the games by the American Olympic Committee. Muhammad Ali refused conscription into the military during the Vietnam War; citing his religious convictions and proclaiming that he had no arguments with the Viet Cong. In response, Ali was stripped of his heavyweight boxing crown and was unable to earn his living as a boxer until the Supreme Court overturned his conviction. In more recent years, baseball player Carlos Delgado refused to acknowledge the singing of “God Bless America” in many ballparks following 9/11. On the basketball court, Mahmoud Abdul-Rauf (formerly Chris Jackson) of the Denver Nuggets was suspended in 1996 by the National Basketball Association for refusing to stand during the playing of the National Anthem before reaching a compromise that allowed him to stand and pray with his head lowered during the song. A similar controversy occurred in November 2014 when Dion Waiters of the Cleveland Cavaliers refused to join his teammates for “The Star Spangled Banner,” asserting that his Islamic faith made it difficult for him to honor a nation in arms against his faith. Waiters retracted his statement, but he was traded and now plays for the Oklahoma City Thunder. In more recent days, the supposed tranquility of American sport has been disrupted due to concerns with violence perpetuated by the police against black men. In protest of the shooting of Trayvon Martin in 2012 by George Zimmerman, LeBron James and Dwayne Wade got their Miami Heat teammates to join them in a photograph with all the players donning hoodies similar to the one Trayvon Martin was wearing when he was killed. 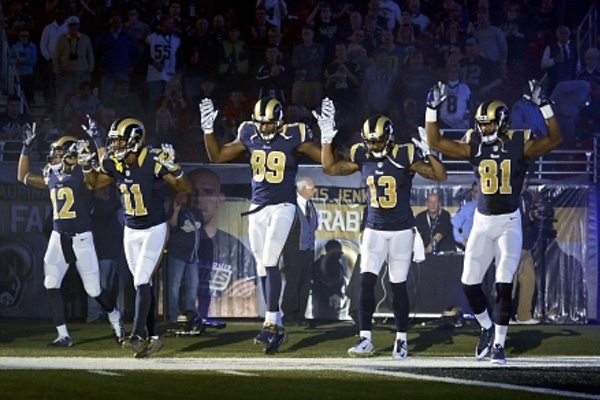 Following the failure of a grand jury in late November 2014 to indict policeman Darren Wilson for the shooting and killing of unarmed black teenager Michael Brown in Ferguson, Missouri, football players from the St. Louis Rams entered the playing field with their hands up—a move of solidarity with protestors asserting that Brown was shot while trying to surrender. In addition, both professional basketball and football players, primarily black, appeared in pregame workouts wearing shirts containing the slogan “I Can’t Breathe”—a reference to the failure of a New York City grand jury to indict a city policeman for the choking death of a black man, Eric Garner, for allegedly selling untaxed cigarettes. Garner was noncompliant but not violent before he was taken down by police, complaining that he could not breathe. In the wake of the Brown and Garner killings, protests were held on the streets and playing fields of the nation. After the assassination of two New York City police officers in December 2014, the protest against police brutality has largely disappeared from America’s games, and sport has apparently resumed its status as escapist entertainment free from divisive political concerns such as inequality and racism. Thus, as we enter the championship season of football at the professional and collegiate levels, controversy is avoided as we begin the games with military jets flying over stadiums, military honor guards, public recognition for veterans and current members of the military along with their families, fireworks and cannons, the unfurling of gigantic American flags, and the performance of patriotic songs such as “God Bless America” and “The Star Spangled Banner.” These opening game ceremonies are usually accompanied by television broadcasts in which the networks, sponsors, and announcers proclaim that we are able to enjoy the games in the comfort of our own homes because we are under the protection of military personnel stationed in over 700 outposts scattered around the globe. Invariably, we are shown enthusiastic soldiers watching the game at American outposts in areas such as Afghanistan. These images of American exceptionalism linking militarism, patriotism, and the global reach of American empire with the nation’s sporting culture are, of course, considered apolitical. The careful manipulation of patriotic and military symbols in support of consumer culture and advertising dollars obscure a political agenda in favor of capitalism, militarism, and empire at the expense of more humanitarian values. While honoring veterans, many of whom have been severely injured in their service, why can we not also celebrate those peace activists who have dedicated their lives to eradicating the scourge of war from the planet? Rather than quarantining them, why not honor the health care workers and organizations such as Doctors Without Borders who have risked their lives to battle Ebola in Africa? Why not honor the heroes of the Civil Rights Movement and those continuing the struggle for racial equality in this country? Why not commemorate the environmentalists and scientists fighting the threat of global warming? Why not proclaim the everyday heroism of teachers and workers alongside police, fireman, and soldiers? The answer to these questions is that we have allowed the realm of sport to become the playground of vested interests and the status quo. Issues of racism, economic inequality, police brutality, environmental damage, gun control, and antiwar activities are perceived as controversial, political, and divisive, while militarism, empire, and American exceptionalism are construed as fundamental values above debate or questioning. Accordingly, our games and circuses are orchestrated to enforce the political status quo, and the context in which we play our games are hardly neutral. As you sit comfortably in front of your television before the championship game, take a moment to think about the images of militarism associated with the contest. Athletes are only considered political when they speak out on racial, social, and economic issues, but they need to recognize that they are regularly employed by the government and corporate America in support of militarism, capitalism, and empire. The games are hardly neutral, and fans, as well as athletes, should stay vigilant and aware of how sport is used. Rather than simply embracing militarism, exceptionalism, and empire, as citizens and athletes we should support a higher patriotism in which we do not blindly follow the flag into military expansionism, but rather insist that we honor America by assuring that the nation adheres to its founding principles. As the Scottish migrant Frances Wright proclaimed in 1824, in what is believed to be the first Fourth of July oration by a woman, patriotism is “employed to signify a lover of human liberty and human improvement rather than a mere lover of the country in which he lives, or the tribe to which he belongs. . . . A patriot is a useful member of society, capable of enlarging all minds and bettering all hearts with which he comes in contact; a useful member of the human family, capable of establishing fundamental principles and of merging his own interests, those of his associates, and those of his nation in the interests of the human race.” A true neutral playing field.